In the fall, pumpkins are everywhere: in the garden, in the supermarkets, and on doorsteps. But do you know how they grow from a tiny yellow seed to a pumpkin? 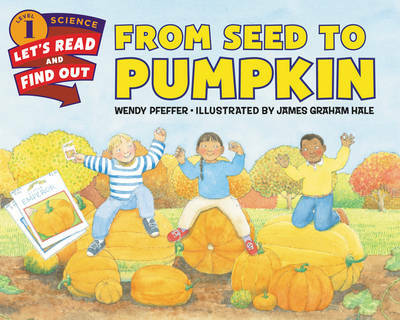 In this classic Level 1 Let's-Read-and-Find-Out picture book, Wendy Pfeffer's lively text combines with James Graham Hale's beautiful watercolors to bring readers into the pumpkin patch to show them how little seeds transform into big pumpkins. Now rebranded with a new cover look, this book includes a find out more section with activities such as an experiment to show how plants use roots to drink water from the ground and a recipe for roasted pumpkin seeds. Both text and artwork were vetted for accuracy by Barbara J. Bromley, Mercer County Horticulturist. This is a Level 1 Let's-Read-and-Find-Out, which means the book explores introductory concepts perfect for children in the primary grades and supports the Common Core Learning Standards and Next Generation Science Standards. Let's-Read-and-Find-Out is the winner of the American Association for the Advancement of Science/Subaru Science Books & Films Prize for Outstanding Science Series.